When you think of Brittany (Brittany Property Guide), that region so beloved of we Brits that is situated in the north-west of France, you think of beautiful beaches, endless stretches of golden sands backed by quaint mediaeval towns. The very name of "Brittany" makes you want to pack your bucket and spade, and head for the sands, sit outside a little pavement café eating mussels and crepes, and feast your eyes on some of the most stunning seascapes that France has to offer. Brittany is a word that is synonymous with the seaside. All four of its departments have a coastline, and the region is notable for possessing some of the best beaches in the country. 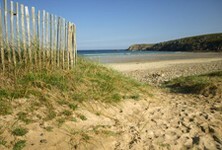 Traditionally, Brittany's beaches are family beaches, having safe bathing and great expanses of golden sands that are perfect for old fashioned fun, but these days there are beaches and resorts that cater for all groups of people, offering exciting adventure sports, gourmet dining experiences, a buzzing social and night life and cultural breaks. The choice of "best Breton beach" was never going to be an easy one, but the beach of Saint Cast le Guildo (Saint Cast le Guildo Property Guide) makes an exceptionally strong case in its claim to the title. Lying in the very north-east of the Côtes-d'Armor department (Côtes-d'Armor Property Guide), Saint Cast le Guildo beach offers the perfect seaside experience for one and all, with fine golden sands contained and protected by sweeping bays and cliffs. Meanwhile the resort is charmingly authentic, a real taste of Brittany along with a well preserved sense of history and culture, yet the amenities are sophisticated and extensive. Not only is it an historical centre of culture, it is also a gourmet's heaven with arguably the best seafood in the region brought to its fishing port daily. The well equipped town also provides entertainment for all ages. Enough reasons as to why St Cast le Guildo represents the very best of Breton beaches? There are five sections to Saint Cast le Guildo's beach, so starting on the east coast of the peninsular and continuing round to the north and west we have: La Grande Plage, La Mare, La Pissotte, La Fresnaye and La Fosse. Between them they answer not just one of the myriad of requirements of holiday makers, but all of them. In one go. These sandy areas of beach are pristine and scenic, while the sporting activities which range from kite surfing to sandcastle building, ensure that no matter who you are you will find something to delight you in Saint Cast le Guildo. Around the beach you can also find a proliferation of cafés, bars and shops, with seafood being a very popular offering. While the beaches of Saint Cast are spotlessly clean, there is not yet a Blue Flag guarantee of water purity, though it is said locally that the fact that the mussels survive and breed so prolifically in the mussel beds of the resort, is proof that the water is of excellent quality. (For further information about the Blue Flag programme, visit their website at http://www.blueflag.org/). Meanwhile the French Ministry of Health's website (http://baignades.sante.gouv.fr/editorial/en/accueil.html) has awarded La Mare, La Pissotte and La Fosse, A grades for water quality for four years, La Grande Plage B grades, and La Fresnaye A, B and C grades. 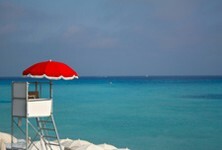 With regard to safety, lifeguards are on duty along La Grande Plage throughout the season. La Grande Plage has showers and waste bins, as well as access for those with reduced mobility. It also offers deckchair hire and parasols in season. La Mare and La Fresnaye have umbrellas for hire too, with drinking water available, toilets and wheelchair access. Pets are allowed on La Pissotte, and La Fosse has wheelchair access. Alongside the beach is the town of Saint Cast le Guildo, which is a traditional yet long established resort, having had plenty of time and experience to enable it to develop excellent and extensive facilities that enhance its reputation as the resort with everything. The harbour not only adds to the colourful picture, but also offers the chance to take boat trips, to enjoy the beautiful coastline from the sea, or to take lessons with qualified instructors and learn to sail yourself. Saint Cast le Guildo has many shops, ranging from well stocked supermarkets to quaint little gift shops, and it is possible to also find sports equipment hire shops for the many sporting activities available. There are discos and nightclubs, always handy for keeping the energetic night birds in the party happy, and endless clubs and activities laid on for children, taking the pressure off the parents and allowing vital relaxation time. The town hosts numerous cultural events too, with fêtes concerts and art exhibitions. Saint Cast has plenty of public transport to get you to the beach and around the town, with buses, taxis and even bicycles available for hire for the energetic. Many of the beaches have direct access from the road and can be accessed by those with reduced mobility. If you have a car, then don't worry about finding parking space for it, because this resort is well supplied with public car parks and parking areas near the beach. Of course it can be busy in high season, so be early if you can to be sure of finding parking near your destination. Saint Cast has all classes of hotels as well as many homely chambre d'hôtes (Owning Gites and Chambres D'Hotes (B&Bs) in France), apartments, gites (Gites for sale), villas and campsites (Buying a campsite in France) at the edge of the resort. Of course owning a property here would solve all your problems. Though as with all areas of France, those properties on the coast are usually more expensive than slightly inland, so it may be prudent to look just slightly outside of Saint Cast le Guildo for a bargain property. Currently (2011) there is a four bedroom detached house, just 300 metres from Saint Cast le Guildo beach, on the market for just over 300,000 Euros, while inland just ten minutes from the coast is a two bedroom property for just over 100,000 Euros. You have to visit nearby Dinan (Dinan Property Guide), a beautiful mediaeval town with character and history oozing from every stone. The Côtes-d'Armor is a fantastic department to explore, and it is highly recommended that you hire a car to make the most of your stay in the area. Shoppers will love St-Malo (St-Malo Property Guide), with its hypermarkets and bustling atmosphere, while the Breton countryside near Saint Cast is utterly beautiful and worth discovering for yourself if you prefer a quieter day out. Saint Cast le Guildo is the beach resort with everything. No matter who you are, or what you seek, you will find it here. Even if you crave peace and tranquillity, Saint Cast le Guildo can offer it... although you will probably have to visit out of season! Joanna Simm moved to the Languedoc area of south-west France in October 2004 having found her property through French Property Links.